A tick bite rash happens when a person has been exposed to ticks and has been bitten. It can also happen when a tick manages to attach itself against a person’s skin and releases significant amount of infected saliva into the skin to the blood. Diseases resulting from tick bites vary and some of them can be managed on your own with some simple remedies available at home. Some infections, however, may require clinical intervention or at worse, a hospital confinement although a rare occurrence. Tick bite infections may be difficult to diagnose but an early recognition makes treatment easier and can help avoid severe complications. Erythema migrans in Lyme is the rash that appears in as short as 3 days or as long as 30 days. Then fever often follows. The circular rash where the bite occurred is the first sign of infection in about 80% of persons who contracted it. While the rash is not relatively painful, it could spread in other areas of the body. This is one of America’s deadliest tick-borne diseases. How it starts and the appearance of RMSF lesion is not always the same for different persons. About 10% of those afflicted don’t even develop the typical tick bite rash. Should a rash develop, it usually does within 5 days after a fever. It appears as small and flat pinkish lesions starting at the extremities spreading to the body. Some infected persons develop darker rashes starting on the 6th day. This rash typically starts to appear along the skin area that is the entry site of the organism. The skin ulcers associated with tularemia affect groin and underarm lymph glands and cause some discomforts. 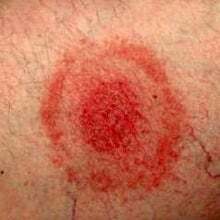 If the rash of Lyme is called “bulls eye” because of the expanding red lesion looking like a red ring with a lighter center, the tick bite rash called Southern Tick is similar. However, it does not affect the joints nor does it have the same neurologic symptoms associated with Lyme. This infection affects mostly children but also about 30% of adults. The typically red rash could appear flat or with small raised bumps. In some cases, eruptions could occur. Tick bites may not always result to a medical emergency but when it is accompanied by fever and skin rashes, you would want to play it safe by consulting a doctor. The sooner you do could spell better success in treatments. Ticks continue to be a threat because of the different kinds of diseases they carry and new organisms that result to tick bite rash continue to emerge. Other than those mentioned above, emerging diseases include Congo-Crimean hemorrhagic fever, human anaplasmosis and new Rickettsia strains. If you are mostly outside and in areas where ticks may be thriving, you may be exposing yourself to the dangers of Lyme disease and other tick-borne diseases. Children below 14 years old are also at higher risk because of their younger and weaker bodies. Older people may also find it difficult to combat infections brought about by tick bites. In the event that a bite is discovered, prompt treatment is vital before complications arise. The effective defense against tick bite rash is prevention and in case of a bite, quick action.